Embroidery is a delicate craft dating back to the 5th century BC that generally conjures up images of old ladies in rocking chairs, fancy wedding dresses, or medieval women passing the time. My love of embroidery began as I wandered antique shops as a child and fell in love with fancy floral pillows and dainty monogrammed handkerchiefs. The only thing to rival my fondness for embroidery was a love of paper. Once I learned that bookbinding was simply stitching a wonderful variety of pages together— I never looked back. My bookbinding work often features intricate hand-stitched details, either on the spine, the cover, the pages, or even throughout entire books. The images you see here are my take on modernizing a handicraft that I've admired my entire life. 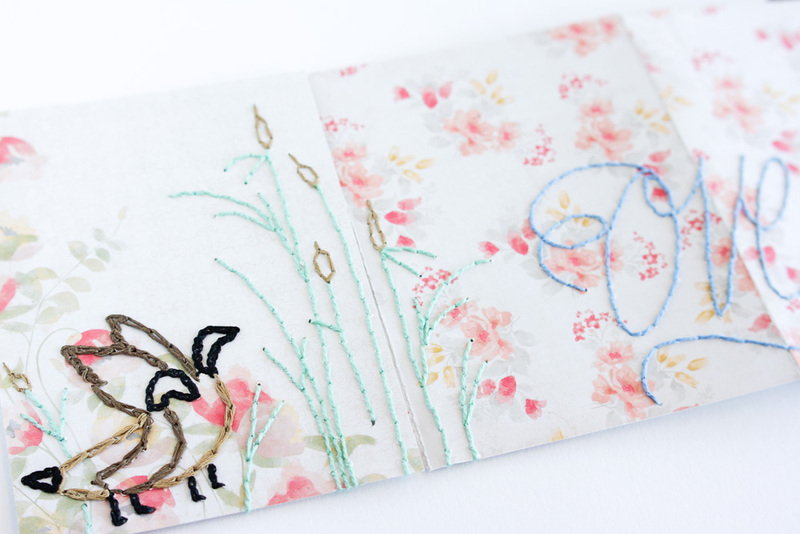 This collection of hand embroidered details on paper was created as the backdrop for a one-of-a-kind book that can be seen here. To explore additional examples of my "vintage made modern" stitchery, click here. If you like what you see and you're interested in having a hand stitched piece of art created for you or a friend, just shoot me an email on the contact page.